Whether you have little people at home, or have little nephews and nieces popping round at Easter, I just think these little bunnies make a perfect lunch time, picnic treat or can be given as a gift! Now if you don’t have Honey Nut Shredded Wheat to make your bunnies, I am sure you could just substitute the regular Shredded Wheat in. 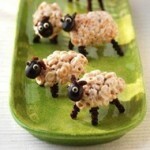 Then make up as per the recipe but possibly drizzle with honey if required or sprinkle with sugar to sweeten? (or not). greaseproof paper, or tin foil. 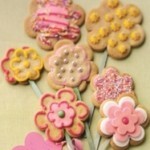 For the large centrepiece bunny, you will need extra licorice for whiskers! Place the Honey Nut Shredded Wheat in a plastic bag and crush with a rolling pin until broken into small pieces, do not make the pieces too fine, we want to make this crunchy! Place crushed cereal into a bowl. Place the butter and condensed milk into a microwavable bowl, and heat on medium until melted, mix together until combined, and add to cereal. Then add the coconut and mix well. Leave to cool. Using a tablespoon, form mixture onto the spoon to make 6 large ball shapes, and slide out from the spoon onto prepared baking sheet. ball onto the large ball, to form a bunny shape. Pinch the small ball to make 2 upright ear shapes. Press currants into the bunny head shape to form 2 eyes and a nose. When firm, attach a marshmallow tail by dipping one side of the marshmallow into a little milk (use condensed if you have any left), and press firmly onto the bunny. 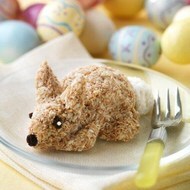 Let us know what you think of these cute Honey Nut Shredded Wheat Bunnies. We always love your feedback!